Prefab Farm House Manufacturer in Delhi, Prefab Farm House Supplier in Delhi, Prefab Farm House in Delhi. We are of the leading manufacturer and fabricators builders of highly grade Prefabricated Farmhouses for all our renowned customers. This Prefab Farmhouse is made of high-grade Light Steel or Pine Wood and raw material sourced from our trusted and market reliable vendors. Our range includes Prefab Home, Prefab Building and Prefab Farmhouse and Villas. 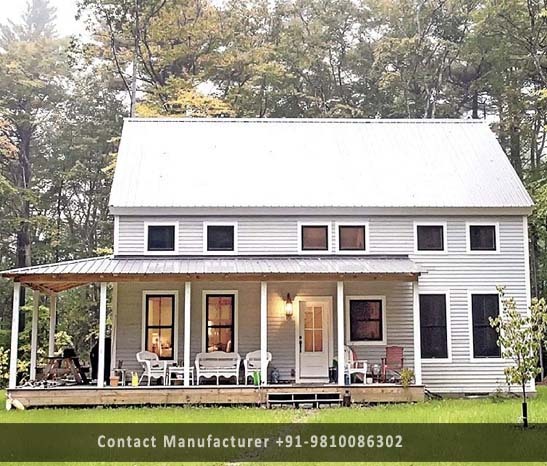 We are Enriched with huge domain experienced in this prefab market, we bring the new application and specific product range of Prefab Farmhouse in Delhi Which is dimensionally accurate and perfect in nature and ensures unique designs as per client needs. Our entire range is balanced in nature and ensures ECO-friendly in nature. Our Deigns are not only attractive but also ensure durability & portability. •	These are so strong against extreme weather condition.